All of the classes at Training Loft 714 are appropriate for all ages and all fitness levels. The classes are designed to give everyone the best possible workout in a fun, safe environment. Everyone is encouraged to go at their own pace and to modify to their own specific injuries or health concerns if needed. 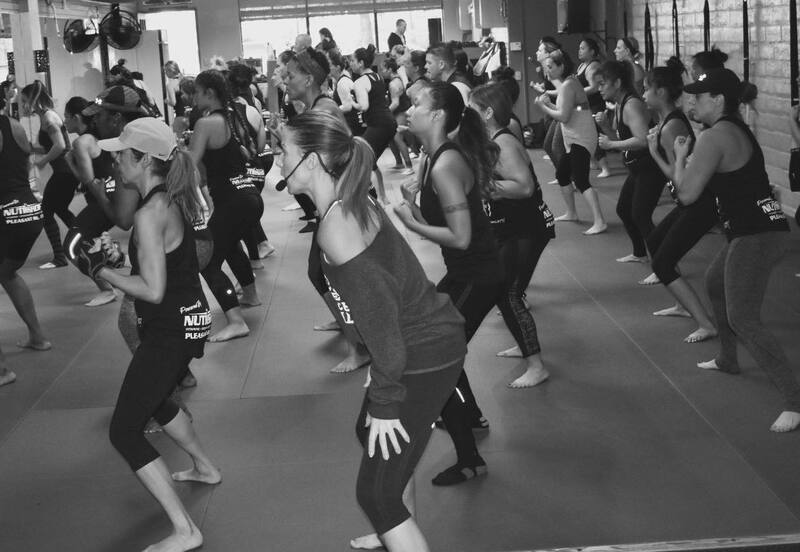 We offer a wide variety of classes from high impact kickboxing, to no impact yoga and everything in between. All classes are 60 minutes unless otherwise specified. There is something for everyone here at the loft. All we ask is that you come in with an open mind and ready to give 100% to the program. Our trainers are tough and our classes can be challenging, but there is a reason that we have such a high success rate. We are a barefoot facility and encourage all of our members and guests to either remove their shoes, or put on clean shoes before stepping on to our matted area. Wear appropriate workout attire and bring a towel and we will see you at the loft! A combination cardio kickboxing class with punching, kicking, and rhythmic movements set to heart pounding music! This workout is designed to melt away pounds and inches while targeting every muscle group in the entire body. Burn more calories then ever while increasing endurance and muscle tone, improving coordination and flexibility and getting in the best shape of your life. In this 30 minute version of our kickboxing class we will push you to the limits as we try to accomplish most of what we do in the entire hour class. If your short on time but still want to get a great workout and burn the maximum amount of calories, this is the class for you! Get your body in shape fast with the most intense sculpting class you’ve ever experienced. This cardio sculpt workout is designed to hit every muscle group in the entire body with weight training/resistance techniques modified into a class format. 30 minutes of kickboxing followed by 30 minutes of muscle fatiguing sculpting exercises will force your body to be the leanest it’s ever been. A one hour, full body, fat burning, muscle building, putting your body to work class that pairs bursts of cardio with body weight movement & weight training. This class is for any & all fitness levels. Get ready to challenge your endurance & mobility level while building a body that will help you achieve anything your heart desires. The feeling of high energy and physical & mental strength will last all day! Introducing Body Work Cardio, an energy generating, heart pumping, calorie burning class that gives a whole new meaning to the saying "Sunday Funday." This ramped up spinn off of Kati's Body Work Bootcamp will include 25 minutes of endorphin inducing nonstop cardio, 25 minutes of body work (muscle shaping & strength training) and 10 minutes of stretching. This class will leave you feeling stronger, accomplished and dripping with sweat! TRX Training is a revolutionary workout system that leverages gravity and your bodyweight to perform hundreds of exercises. Pair this with intense HITT Training, weights and floor work and you get TRX Body Shock! Anyone can take this class as you can modify all exercises by simply increasing or decreasing the resistance, body position and intensity. Increase core and overall muscle strength while challenging every muscle in your entire body to build a leaner, stronger physique. Total Body Circuit is just that, a circuit style class that will challenge and strengthen your entire body! You will engage in 1 min timed exercise intervals ranging from body weight exercises to weight training and everything in between! Intermittent bursts of cardio are incorporated throughout the class to keep your heart rate pumping and calories burning! Come try this high energy class were sure you’ll love it.